A friend posted this image, and naturally, I laughed. I shared it with other friends, and they laughed too. That this situation was so widely recognized, however, made it cause for crying rather than for laughing. 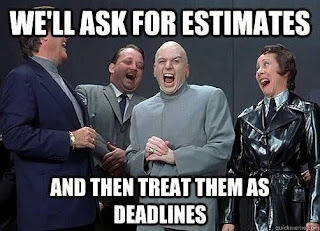 Stating the obvious, estimates are not deadlines, and buffers -- proper spacing between milestones -- are needed for good project management. In practice, this advice is lost, and the result is bad software. Failure to implement buffers ignores the unexpected: people leave, requirements change, a show-stopping bug is found. Without buffers, one unexpected problem cascades to all the milestones downstream. Some project managers play it "close to the vest." They really do have buffers in the schedule, keep them a secret, and hope the developers continue to work hard to meet the original deadlines. The hazard here is that the developers will make (unnecessary) compromises to meet them. 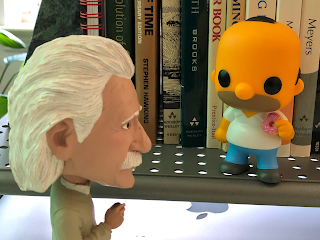 Einstein: So Mr. Simpson, what makes you say the universe is shaped like a doughnut and is expanding? Homer: Mmmm, expanding doughnut. Einstein: Do you think the expansion is due to dark matter and dark energy? Homer: Dark matter? Oh, you mean chocolate. There's lots of energy in chocolate. Einstein: Hmmm, chocolate? Homer: Mmmm, chocolate.